Feeling Puzzled About Creating and Maintaining a Successful and fulfilled Life? Get Yourself a Coach! Direction in acquiring new skills and knowledge along with consistent support and encouragement can help you create the life and business you envision. Increase your success through business coaching with Dr. Hema Pokharna. Coaching provides support for you in resolving problems and provides suggestions to implement change for a more efficient, vital and flourishing profession. No successful athlete would be without a personal coach to ensure victory. There is no wonder why most prosperous business owners have worked with a consultant or a mentor to advise and support them along the way. Creating a dynamic fulfilled life on your own is a challenging process. Mastering the skills needed to get choice and control in your life can take a long time if you are working alone. Are so intent on "doing it yourself" that you never get it done? Don't know how to nurture and grow personal and professional life? Lack satisfaction in aspects of your work and life ? Don't have enough time and energy? Have difficulty promoting harmony and peace in your relationships? Feel stuck and don't know how to move to the next level of your potential? Work very hard and earn very little? Personal and Professional Coaching Programs Help You Put the Pieces Together. conflict and efficient time management. Clarified and completed goals and objectives within set time frames. Expanded options and choices to live fully. Effective practical materials to help bring the best in you. Accurate valuation of present life assets for a fulfilled life. Identification and breakthrough of psychological barriers to success. Additional knowledge of pertinent information and resources. Coaching Sessions are Available Via Telephone or On-Site in a Variety of Formats. 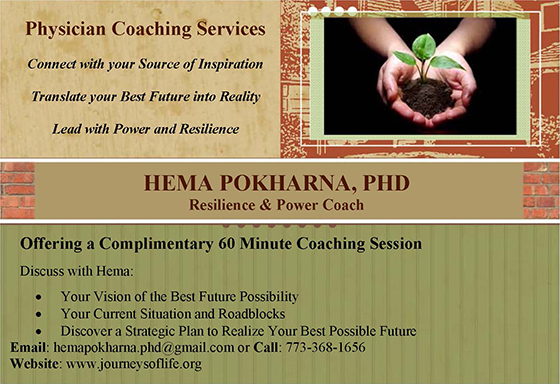 For More Information or to Schedule a Coaching Session, contact Dr. Hema Pokharna, Ph.D.